2016 may (or may not) be remembered as the summer when William Kentridge exploded onto the Berlin art scene. 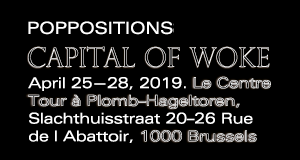 ‘No, It Is!’, an extensive solo exhibition of the artist’s three-decade-long career, runs at the Martin-Gropius-Bau until the end of August. Meanwhile, during July a diverse program of performances and further exhibits ran in parallel at the Berliner Festspiele, including the ‘Drawing Lessons’, a series of autobiographical performance lectures which were reportedly the point of departure for the current exhibition. Introducing the work of this multi-faceted artist is not as simple as might first be thought by those who are familiar with his charcoal drawings and films. To attempt to map out the breadth of his practice would mean connecting South African political history, autobiography, literature, mythology, astrophysics, philosophy and art history, just to start. In-between we could join the dots between recurring motifs: the clock, the typewriter, the pair of scissors, everyday objects taking on anthropomorphic presences through their animation, with repeated references to the body and its rhythms. However, if we could define the components, we would then have to erase, reverse, tear up and re-constitute them, while questioning ourselves as to whether we ever thought of it at all. The exhibition at Martin-Gropius-Bau opens with a selection of films, which play out these sequences of creation and erasure. 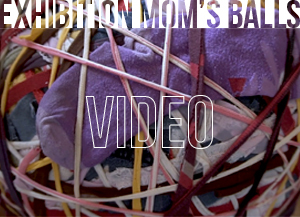 Screened simultaneously in an immersive welcome, we meet the artist navigating the studio and the act of making. There are reversals of time; books effortlessly caught, flying drawings elegantly placing themselves on the wall. In a simple inversion of black to white, ants running around a white surface become stars in a frenetic galaxy. Further rooms have a more casual feel, works are hung on walls part covered in paper, visibly taped, or placed on similarly covered trestle tables. Seeming incompatibilities co-exist and there is a pervasive sense of provisionality. A maquette of the exhibition is shown alongside other evidences of his working methods and decisions, this transparency equally reflective of a fundamental approach to art-making, to life. 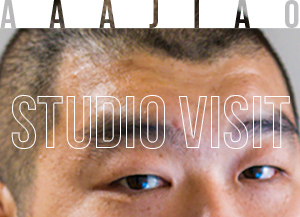 Here the studio is a microcosm of the universe and actions taken within it become reflective of ethical attitudes. The ever-present artist is the genesis of this creation, it’s therefore critical that the works are scattered with self-irony, humour and doubt. He mocks himself time and again, celebrating stupidity and critical of the aggrandisement of certainty. 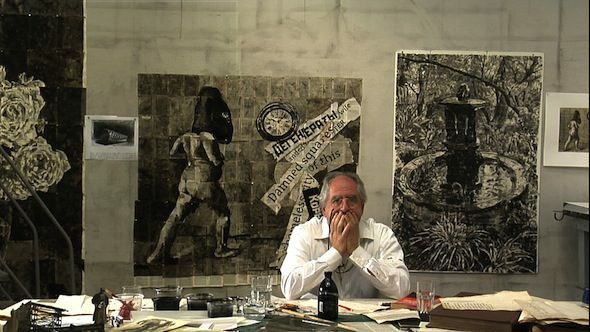 The opportunity to experience such a comprehensive survey of Kentridge’s œuvre reveals a sense of how he not only seamlessly moves through disciplines—drawing, animation, sculpture, print and performance—but also the breadth of his thought. In ‘More Sweetly Plays the Dance’, a seven-screen video projection with loud speakers, a procession of shadowed characters journey through the room to a hypnotic, celebratory score. The imagery is simultaneously evocative of migration through barren lands and of carnival, both evoking a larger sense of time in a march towards inevitable mortality. This concern with time concludes the exhibition, with a further installation, ‘The Refusal of Time’. The project emerged from conversations the artist had with physicist Phillip Galison and since its appearance at Documenta 9 has been developed into a complex stage performance shown as part of the program at the Berliner Festspiele. 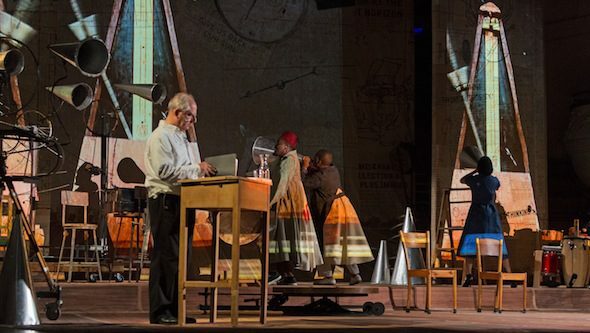 Written and directed by Kentridge, who then worked with a choreographer, composer, several dancers and musicians, the stage version of ‘The Refusal of Time’ begins with the myth of Perseus and navigates time up until our current understanding of black holes, the libretto read by Kentridge, a natural raconteur. 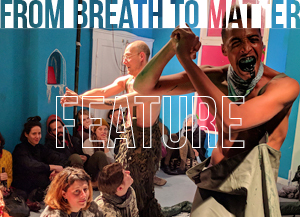 It is ultimately another story of the march towards death, of trying to escape one’s fate, played out in a glorious cacophony of film and performance, of energies and rhythms, words, bodies and song. Moving between the gallery and the stage, the highlight of the program was undoubtedly at the meeting point of the two. 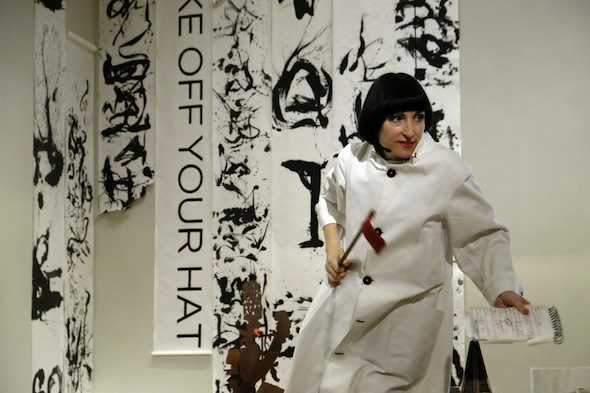 In ‘A Guided Tour of the Exhibition: For Soprano with Handbag’, performer and collaborator, Joanna Dudley brought the influence of Dada to life as she walked us through the galleries. “Follow me” she instructed in earnest, wheeling a megaphone on unwieldy wooden steps behind her, the tour guide’s red flag held up in the other hand. Each room provoked a different response from Dudley, who ‘describes’, declares, sings and moves at a tempo sliding between cool repose and hysteria. Words are spoken, reversed, swallowed, contested. On meeting a recording of Kentridge calmly reading from texts which form part of his body of work, she approached the speaker like a suspicious cat, back curled and hyper alert… “Falsch!” Joanna screamed, “Incorrect!” The dialogue she entered into with Kentridge’s spoken text, which in itself questions how we construct argument, is nothing short of brilliant. With utter conviction, her proclamations of falsehood deconstructed anything we may have thought the exhibition claimed to be. A hilarious parody of the absurdity of certainty, and in turn portraying an incredible clarity of thought. 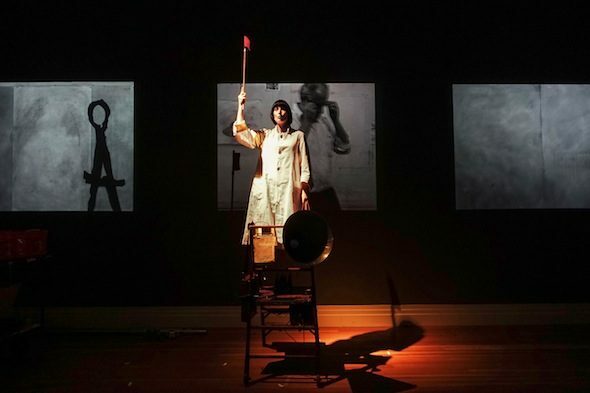 “Beauty is truth, truth is beauty.” recurs almost in whispers throughout William Kentridge’s universe, a haunting, problematic and Romantic statement which brings us to the heart of the matter. 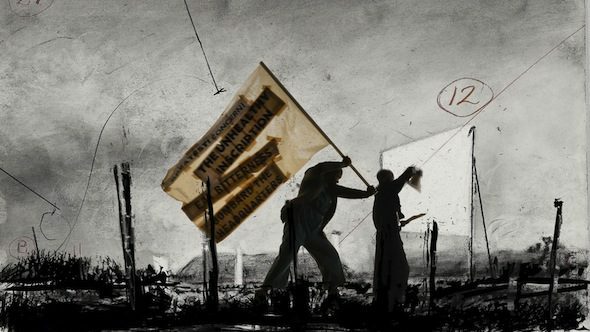 Although the works initially appear to be fictions, it is by pushing to the point of dissolution, by erasing, inverting, rewinding and contesting, through fragility, instability and uncertainty that Kentridge ultimately brings us close to a sense of truth.